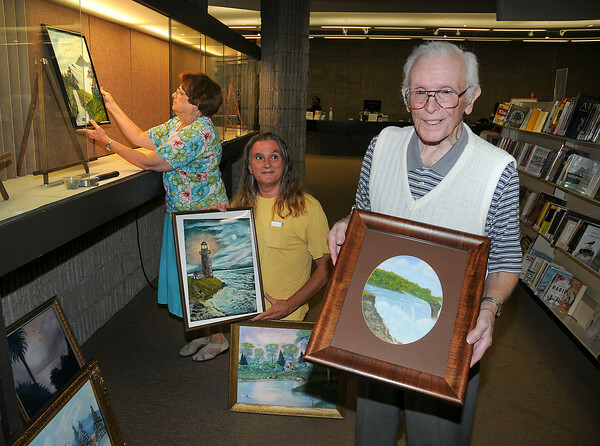 James Neiss/staff photographerNiagara Falls, NY - Niagara Falls Public Library Specialist Wendy Udy, left and Alfred Ligammari, Jr., center, help Alfred Ligammari, Sr., 88, of Niagara Falls, install his art at the library. The senior Ligammari is having a retrospective exhibit of his paintings, comprised of about 36 works which were created over the course of 70 years and will be on exhibit through the end of September. Ligammari said he first learned how to oil paint as a high school student at Trott Vocational.